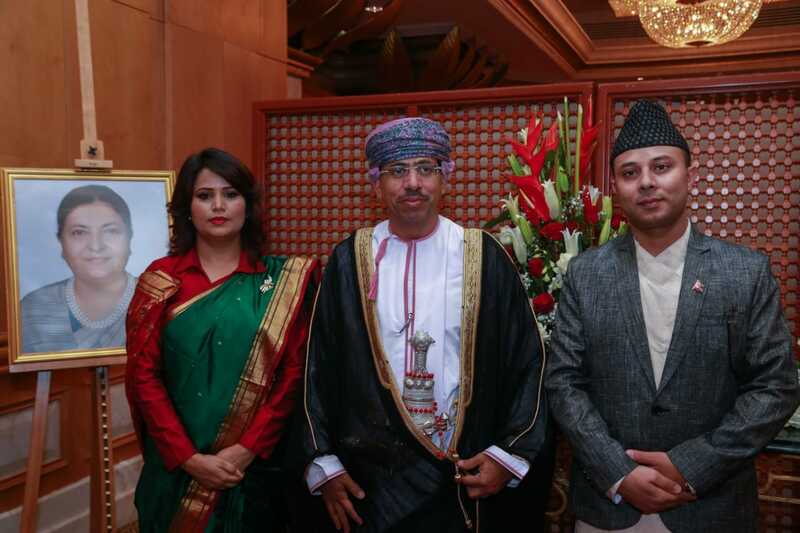 The Embassy of Nepal, Muscat organized a grand reception on the occasion of the National Day and the Constitution Day of the Federal Democratic Republic of Nepal at Hotel Grand Hyatt, Muscat on 19 September 2018. The program commenced with the national anthems of the Sultanate of Oman and Nepal followed by the welcome speech of Her Excellency Ambassador Sarmila Parajuli Dhakal. H.E. Dhakal briefed about the current initiatives taken by the Government of Nepal to implement the constitution, attract the foreign investment, enhance the tourism sector, socioeconomic transformation of the country as well as widen its role in the international arena. H.E. Dhakal highlighted about Nepal-Oman relations that gained momentum with the high-level visit of the then Prime-Minister Sher Bahadur Deuba and signing of the “Bilateral Consultations Mechanism” during the visit. H.E. Ambassador also informed about the various other activities of the Embassy of Nepal. H.E. Ambassador extended her best wishes to His Majesty Sultan Qaboos bin Said Al-Said for his Majesty’s personal health, happiness and wellbeing as well as continued peace, prosperity and harmony for the people of the Sultanate of Oman. Her Excellency invited all the guests, their family and friends to visit Nepal. H.E. 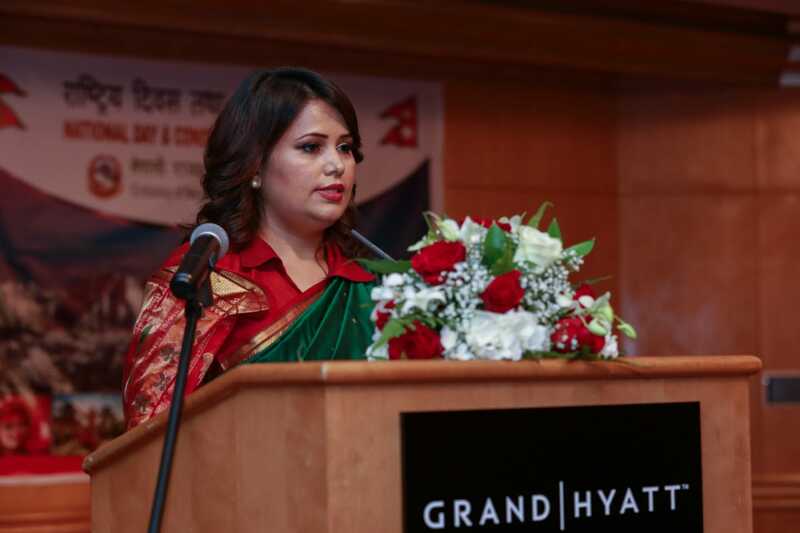 Dhakal expressed her special thanks to the Government of Nepal for conferring her with the prestigious “Suprawal Janasewa Shree” Medal on the occasion of the national day and constitution day of Nepal, earlier the same day. After the speech, Guest of Honour, Hon’ble Dr. Abdulmunim bin Mansour bin Said Al-Hassani, Minister of Information and Her Excellency Dhakal jointly cut the ceremonial cake. The event was followed by the musical performance from renowned Omani Singer Mr. Haitham Mohammad Rafi who sang Nepali song- “Euta Mancheko Mayale kati” and Saxophone tune on Nepali song from Mr. Sewanta Purja Pun who has been appointed as “Head of Music Theory” in Royal Cavalry of Oman 2nd Band. The Embassy also utilized the occasion to promote Nepal’s tourism and culture by displaying photographs and brochures of main tourist destinations, mountains, cultural and natural heritages in the hotel hallway. Video of Nepal’s main tourist attractions and products were played on the screen inside the hall throughout the program. Around 200 guests including the guest of Honour, Hon’ble Dr. Abdulmunim bin Mansour bin Said Al-Hassani Minister of Information, Hon’ble Eng. Khalfan Bin Salih Bin Mohammed Al-Naabi, Member of State Council; Hon’ble Hamad Bin Sulaiman Bin Salim Al-Salmi, Member of State Council; H.E Salim Bin Nasser Bin Said Al-Kahali, Member of Al-Shura Council, H.E Mohammed Bin Ramadan Bin Qassim Al-Balushi, Member of Al-Shura Council; H.E Hamad Bin Khamis Bin Abdulla Al-Amri, Undersecretary of Ministry of Manpower, H.E . Ambassador Shaikh Hilal Bin Marhoun Al-Mamari, Head of West Asia Department- Ministry of Foreign Affairs; H.E. 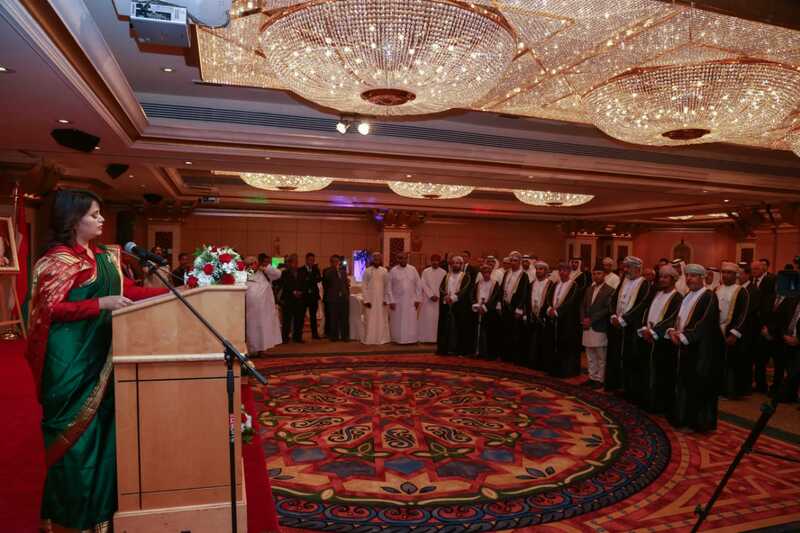 Ambassador Dr. Ali Bin Abdulla bin Ali Al-Alawi, Head of Arab West Zone Department- Ministry of Foreign Affairs, members of the diplomatic corps in Muscat, Business persons, media representatives, Nepali community in the Sultanate attended the reception.